Upon seeing this article I immediately thought about the famous "Triple Self Portrait" painting by Norman Rockwell. 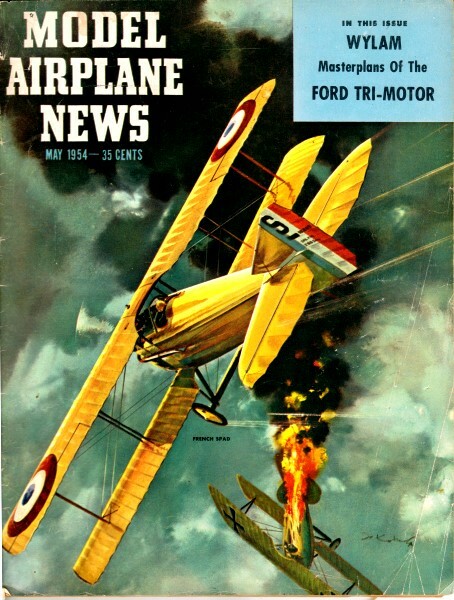 I suppose to truly be an analogy to triple object it would require building a model of a model of a full-size airplane rather than being a model of a free flight model. It's a unique concept. Dynamically similar sheet balsa miniatures of proposed designs check out ideas, reveal the hidden flaws, are invaluable aid before making, testing big ship. Some typical miniatures - Krecek's Gourd, left; Zeek, top, right; Civy Boy, bottom, right - that flew exactly like their full size counterparts. The Torpedo .32 engine affords a comparison of sizes. The building of dynamically similar models in small scale to test our full size gas powered models should not be received as a new idea. 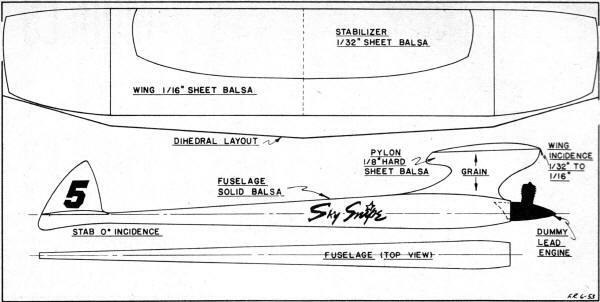 We rather imagine that quite a few modelers over the country have been building these 1/8 or 1/10 scale balsa models to check or correct lateral area placement, fuselage moments, and dynamic stability in general. To the modelers who like to design or modify their own ships, this dynamically similar, or small scale sheet balsa model method, of design will be a short cut to reveal hidden faults in our design ideas. We do not mean that this small scale model method is the only sure way to design a model that has optimum performance. On the contrary; many good free flight models are designed with only basic design fact, a lark, and enthusiasm. Dynamically similar small scale models can really help us with our design ideas and our brainstorms - some of which are good, some bad. When we draw the stool up to the drafting board to create a new overpowered, freeflight rocket, we can really use this dynamic similarity method of design. Small scale models (1/8-1/10 scale) will help us rule out our bad design guesses and keep the good ones. This is true if we can believe the stories these little models tell. It will take only 30 minutes or little more of a modeler's time to find out a few inherent stability facts from a miniature of our miniatures. This writer is fully convinced that dynamically similar models give a satisfactorily accurate account of stability that we seek in our bigger, powered models. Dummy motors made from old cement tubes. Center of gravity, other feature., must be identical to the proposed airplane that will be designed. This really is a mini-Hogan! 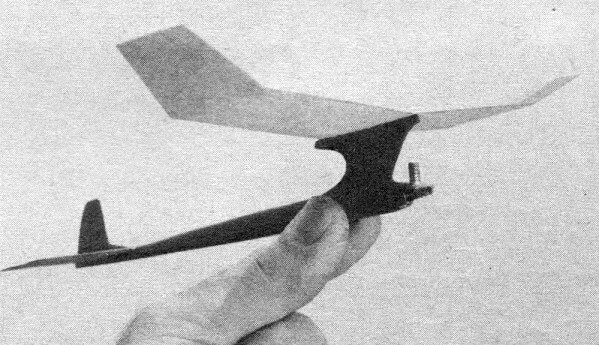 Thrown into bad turns, these gliders show recovery characteristics of design. Wings made of 1/32 in sheet balsa. If you are ready to try this small scale method to check .the abilities of its big brother, here are a few tips: 1. scale or size is unimportant: 1/5 to 1/10 scale seems normal, or try to build the small model with 7 to 9-in. wingspan; 2. do not make an effort to build the model light. Let weight be proportionate to the big ship that may follow the tests of this small one. You could well give this small model several coats of dope; 3. be certain that you use exactly the same nose and tail fuselage moments on this small model as you will on the bigger, powered model. A ballast of lead or cement tube will be needed to simulate engine weight. 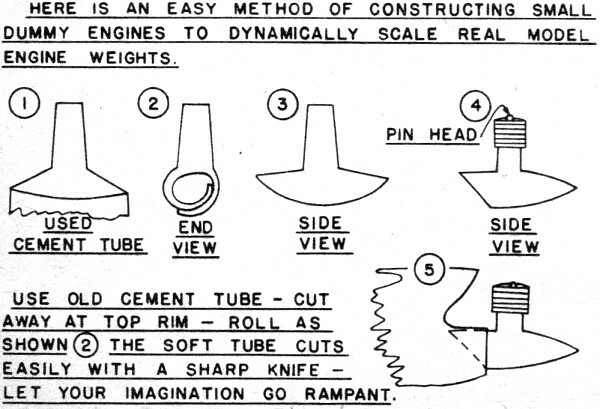 This weight can be a blob of lead, or a neat, small, dummy engine can be quickly fabricated from an exhausted cement tube, (illustrated). Naturally, this small model must have same C G location as the big model; 4. the addition of landing gear on these small models has so far proved little, but if you desire to create a small landing gear, you will naturally have a better parallel. Also, in some design cases, a landing gear with faired struts or large wheels can affect the lateral area of a model; 5. materials to use: 1/32 sheet balsa seems best for wing, stabilizer and vertical fin. These parts may be sanded to a basic airfoil shape, and in cases where you feel unsure about wing and stab airfoil combination, small (similar to the big model) airfoils can be made from 1/16 or 3/32 sheet balsa stock; 6. as a resume: be certain you are reasonably accurate to scale in total model weight, dummy engine ballast, wing area, stabilizer area, fin area, wing dihedral, nose or forward fuselage moment, tailor rear fuselage moment, center of gravity location, decalage. Here is a list of visible flight characteristics that can be noted by experimenting with these dynamically similar models: 1. lateral area placement; 2. vertical fin area characteristics; 3. yaw and roll stability; 4. spiral stability; 5. stall recovery; 6. glide pattern; 7. sensitivity to adjustment. There are three definite forces that affect our full size models that we cannot show by dynamic similarity. These are torque, gyro-precision, destabilizing or upward resultant force of propeller spinning on the nose of the model. Other than these three forces, dynamically similar models tell an interesting story about our free flight models, and most of the other forces that we must encounter to master a free flight design. With only 30 minutes building time, a dynamically similar or small scale miniature will reveal a multitude of free flight problems. These small models can be launched with the force of our arm (which at peak velocity is probably near 45 mph) as we would heave an endurance hand-launched glider. But unlike the manner in which we launch this endurance glider, we can deliberately force these small dynamically similar models into a bad turn. After doing this. we begin to see the inherenr recovery of Our prospective design. The small models will be (or should be) reasonably heavy in scale weight to our bigger ships, so we can see that these small models can be launched into good or bad turns at great velocity with the power of our arm. Is a cabin job as good as a pylon? How do these two gliders compare? Doesn't take long to find out; why not try your own ideas? 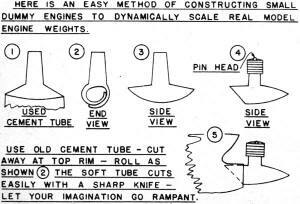 In the illustrations for this article, we have included a method to construct easily the dummy engine ballast that we will need to create this miniature of miniatures. To bear out and give a little more importance to this dynamic similarity theme, we may mention that the Air Force thinks enough of dynamic similarity to spend several million dollars on small scale (1/8 to 1/10) models of some of our present actual jet planes and experimental versions of jet fighters and bombers. And these dynamically similar (yes, in weight and in all factors) models are flown free flight at tremendous speeds and tracked by radar to gain flight characteristics of these planes. Apparently these results are most encouraging. We members of the San Valeers Model Club (San Fernando Valley, Calif.) have been playing with dynamically similar models since 1946. This year, with the help of Jose Tellez, we constructed one dozen dynamically similar models of some of the present day free flight designs. In this group, we scaled and built such models as the Sandy Hogan, Fubar, Civy Boy, Zekes, Skybeau, Tweek, Krecek's Gourd, Zipper and others. We already knew what to look for in the flight characteristics of these small models because we knew what flight patterns and idiosyncrasies these different free flight models exhibited when flown full model size. After wringing these models out with a fairly good arm, our enthusiasm for dynamically similar models hit a new high. We found then, in the small scale versions, that the Hogan actually did fly like a Hogan, the Civy Boy like a Civy, the Zeke like a Zeke, and so on. There may be some who will challenge the worth of these dynamically similar models. But without argument, either way, we are bound to see that these small scale models can be a lot of fun, even for the unbeliever of visible fact. These small models are entertaining for clubs who hold their meetings in, or who have access to, a gymnasium or field house. 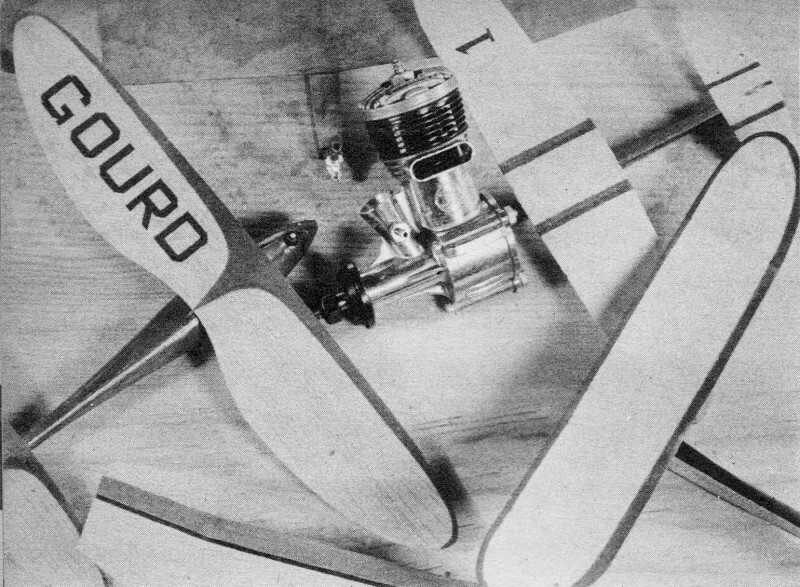 In bad weather that would hamper the flying of full size gas-powered models, model clubs can still have fun and competition by taking these small models inside or to the barn. For the modeler who seriously builds these dynamically similar models to help sift good and bad ideas, it is best to fly in calm air or indoors. By testing these small models under moderate air conditions, we will be giving the "little models" a "little break" that is similar in scale proportion to the roaring sand storms we are apt to chuck our bigger free flights into. Full size plan for a mythical free flight. Whittle the fuselage, cut out the flying surfaces, assemble, and you're set for work or fun.